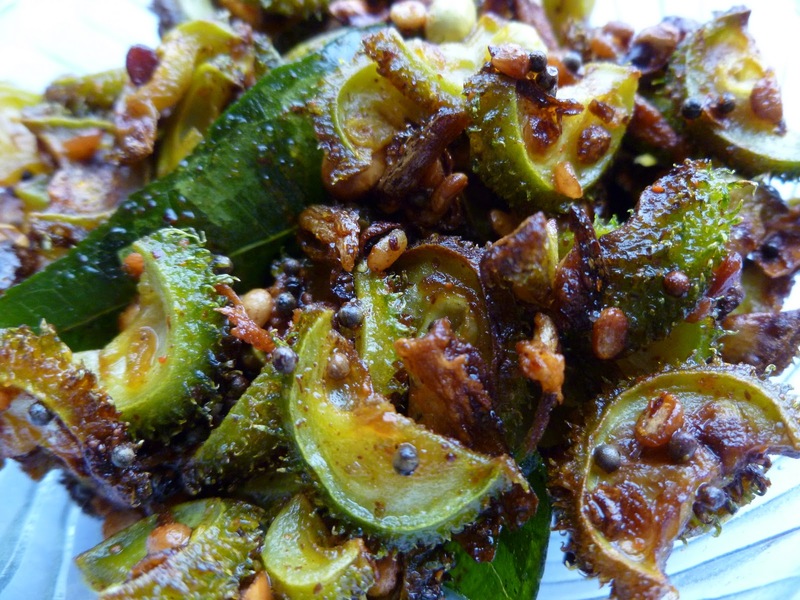 Kantora is a vegetable that looks like a little karela but its not a very bitter like karela. A bengali friend of mine introduced me to this vegetable. It is available every were in north India and even easily available in very Indian grocery store here. It is very good side for rice and rasam. It can be stuffed and cooked like karela. Heat oil in a frying fan and pop mustards. Add urad dal, hing and curry leaves. When urad dal turns golden and add kantora. Add salt and turmeric and cover for a minute. Remove the cover and cook till the kantora turns golden along the sides. Add the chili powder and mix well and remove from flame. Enjoy with rice and rasam. I love this,usually I find it in the frozen section looks so yummy. Yummy..never tried this..pics is absolutely tempting. looking gud...but donno the vegetable or how it looks...willkeep eyes open next time in shop. I have heard about it, but never tried or tasted it..if i get hold of it, surely will give a try. Nice curry....Loved it I never tried this,,,,,need to try now...Thanks very much for visting my space and for a lovely comment....U too have a great blog...I m happy to follow u..
UUuuuh.. this vegie is soo new to me. simple curry .. must b pairing well with rice. This is new information ...everyday learning something new....I am new here....happy to follow u and ur lovely recipes. I too like this vegetable, and here I like your simple tasty preparation.